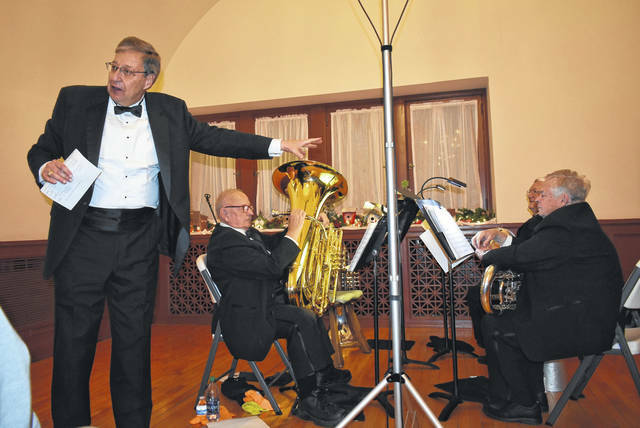 From left, Michael Gallehue, Denny Seifried, Ted Shuttleworth, and Francis Laws perform “Alleluia” during a concert on Tuesday at Troy-Hayner Cultural Center. Cody Willoughby | AIM Media Midwest Western Ohio Tuba Quartet member Michael Gallehue introduces the members of the group prior to a full concert on Tuesday at the Troy-Hayner Cultural Center. 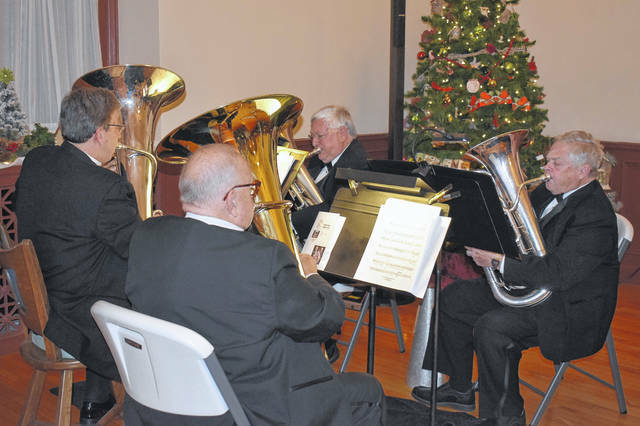 TROY — The Western Ohio Tuba Quartet performed live at Troy-Hayner Cultural Center on Tuesday, presented as a part of the center’s Drawing Room Chamber series. The Western Ohio Tuba Quartet was founded in January 2013, and is composed of four current members of the Ohio Valley British Brass Band, including Francis Laws on first euphonium, Ted Shuttleworth on second euphonium, Michael Gallehue on first tuba, and Denny Seifried on second tuba. All quartet members are experienced performers with retired careers in music education around the Midwest. A variety of musical stylings were performed, including arrangements from classical composers such as Giovanni Gabrieli and Antonin Dvorak, as well as modern American stylings, including fripperies by Lowell Shaw, marches by George Cohan, and the world-premiere performance of “Ash Grove Variations,” a piece commissioned for the quartet by Stephen Bulla. This marked the group’s sixth year performing at Hayner, which has hosted the quartet annually since their inception. The program’s open admission was made possible by local sponsors and citizens of Troy. The event precedes Hayner’s 2018 Holiday Open House, which includes Children’s Day on Saturday, Dec. 1, and the Grand Opening on Sunday, Dec. 2. For more information on events at Hayner, visit www.troyhayner.org. https://www.dailycall.com/wp-content/uploads/sites/30/2018/11/web1_TroyQuartet1.jpgFrom left, Michael Gallehue, Denny Seifried, Ted Shuttleworth, and Francis Laws perform “Alleluia” during a concert on Tuesday at Troy-Hayner Cultural Center. https://www.dailycall.com/wp-content/uploads/sites/30/2018/11/web1_TroyQuartet.jpgCody Willoughby | AIM Media Midwest Western Ohio Tuba Quartet member Michael Gallehue introduces the members of the group prior to a full concert on Tuesday at the Troy-Hayner Cultural Center.